Have you found yourself at the end of a great training session with your dog only to then have your dog pull you out the door? Does your dog behave and listen like an angel inside the house, but act like he has never had a day of training once outside? In the same parallel world, have you ever found yourself in the middle of a mission only to be interrupted by a sudden case of amnesia as soon as you entered a room? Perhaps you were in the middle of writing down a great thought, when your pen runs out of ink. As you cross the doorway to retrieve a pen from the next room, you find yourself frustrated trying to remember why you’re there. There goes your pen and your million-dollar idea! Can there possibly be something related here? Does moving through doorways cause us and our dogs to forget? We often grow upset at our dogs for forgetting all of their training as soon as they step out the front door. We are more understanding about our own forgetful behaviors, and have even found research to validate it. A team of researchers from the University of Notre Dame decided to explore this common and annoying human experience. A series of tests on human memory suggested surprising results: passing through doorways is the cause of these memory lapses. Gabriel Radvansky, Notre Dame professor at the psychology explained, “Entering or exiting through a doorway serves as an ‘event’ boundary in the mind, which separates episodes of activity and files them away.” This system often functions wonderfully because we can not have every piece of memory ready-to-hand. We need to close one memory box to open a new one for the next event or task.” Makes sense to me. I am the guiltiest person among us when it comes to forgetting things; one of my common phrases is, “What did I come here for?” Seconds later, I return to my training room to find my dog giving me the unmistakable “Where’s my treat?” look. That’s right, I needed more treats. Because I experience this all the time, the Notre Dame study made me wonder if doorways might be affecting dogs in similar ways. I often notice dogs who live in apartment buildings pulling their owners from their home to the hallways when it’s time for a walk. Many dogs offer great attention in the elevator, but bolt out the second those doors open. Others sit politely at the door to the outside, but rush out once the door is opened. What is it about doorways that get our dogs distracted? Does the study from Notre Dame apply to dogs? Is memory restoration a part of it? I don’t have the answers and, while I dream of being part of a research team at a university, I am not. Therefore, I can only share my observations and personal thoughts based on my professional experience with dog behavior. To understand dog behavior, you have to understand basic behavior principles, including the principals that behaviors rehearsed frequently often become habits, and behaviors that are rewarded are more likely to be repeated. Stimulus control allows a behavior to be put on cue, if the behavior reliably happens in response to a specific cue. The context in which learning occurs can also become part of the stimulus package. Let’s explore this a bit more. How many times have we picked up the leash, clipped it to our dogs, opened the door and not gone through it or crossed the doorway, but immediately turned back, instead? 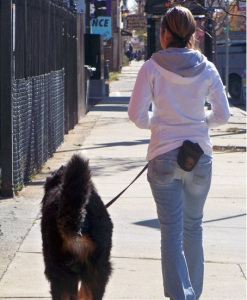 Unless you’ve worked with a rather clever dog trainer, you’ve probably never done this. The most common thing we do in this situation, of course, is cross the doorway and start walking FORWARD. Similarly, how many times have we been in an elevator with our dogs, reached our floor or lobby and stayed in the elevator? Now, you’re probably thinking, “Sometimes the doors open between my floor and the lobby, and we don’t cross out of the elevator when that happens.” True, but it’s not your floor and trust me: dogs know their floors. Now think, how many times has your dog dragged you through a doorway and you followed? Every time that happened, the pulling behavior worked, and was rewarded by movement in the direction the dog wanted to go. Doorways or crossways usually predict forward motion, so they become a contextual cue to walk forward. You might even have your dog on a formal sit-stay, but the moment your release your dog the doorway is cuing forward motion. Crossing thresholds also predict something new (usually on the other side). On the other side of the elevator doors, your dog’s best friend might be waiting to enter the elevator. Crossing your front doorway means going outside–a place full of distractions. Your backdoor might predict a backyard full of squirrels and bunnies. At those thresholds, our dogs are more likely to be focused on those other targets, and no longer on us. Does this sound familiar? Let’s re-visit what Radvansky explained: “Entering or exiting through a doorway serves as an ‘event’ boundary in the mind, which separates episodes of activity and files them away.” Can you see a connection? 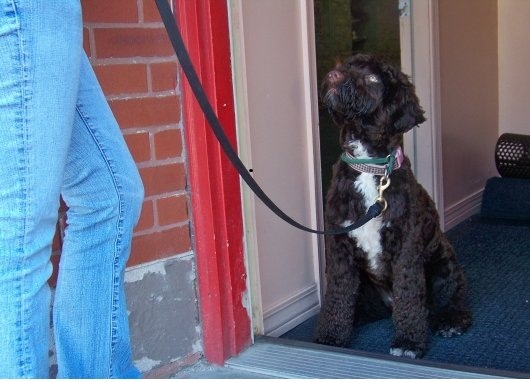 To wrap things up, let’s address how to help your dog not pull you across a threshold. It’s actually not that difficult–just stop being so predictable. Give your dog a reason to pay attention to you. There are three things you can do. The first approach is to have your dog sitting, then cross the threshold first (facing your dog), and then call your dog to you. This way, you have made yourself the primary target after crossing the doorway. If your dog doesn’t come to you, walk back to your dog, walk out again, and call your dog to you again. Second, you can play the “You’re Out, You’re In” game. With your dog on a leash, calmly walk across the threshold and then turn around and calmly walk back inside. Keep repeating this until your dog is more attentive to you, at which time you can reward your dog’s attention by moving a bit further out the door or the elevator. If your dog initially pulls you out the door, don’t get upset, but don’t reward that behavior, either–just step back inside and keep trying. The third approach is to let your dog cross the threshold first (just a few steps ahead of you), while you stay behind. Then call your dog back to you. This is what I do with my own dogs, because it allows me to scan the room for distractions first while my dog has cross the threshold and immediately turned back to me. Whether the reason for pulling is memory loss or reinforced and rehearsed behavior, the truth is that our dogs should be walking nicely with us. The start of your walk sets the tone for the rest of your walk. If you allow your dog to pull you and forget about you through the first thresholds she crosses, then it is highly likely the rest of the walk will also involve pulling and lack of focus. 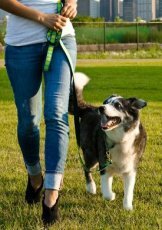 With summer weather finally approaching, taking a few seconds to work on this can predict a safer, more enjoyable walk with your dog. As far as improving humans’ memory goes, I have no idea. Whenever someone finds the answer for that, please send it my way!